This site provides an informative and illustrative approach to hieroglphics an ancient form of writing used by the Egyptians. Over the next few pages you will see the various glyphs and symbols they used. Over the centuries there has been many spectacular cultures with their own unique symbols and alphabets but there has been none as spectacular as the Egyptians with their hieroglyphics. 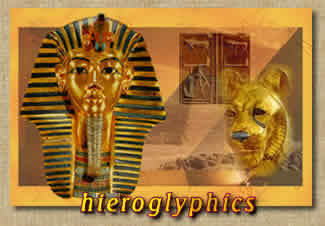 Hieroglyphics were used as a written language. Each of the symbols stood for a sound, unlike English, hieroglyphics were used phonetically.